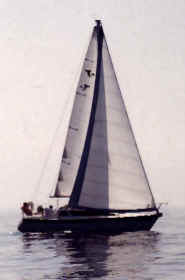 After sailing down to the Keys from Slidell, LA, in December 2003, she has been moved to a new home. (I'll post the ship's log from the trip as soon as I get a chance.) Ils Sont Partis is now sitting on a mooring at the Coconut Grove Sailing Club, in Biscayne Bay.